Auctions on our website always consist of two phases: the initial offer and the real-time dynamic bidding. While in the “Detailinfo” (“Detailed information”) view you may also submit your initial offer with regard to a specific object/car. The initial offer is the first stage of the two-phase auction process that takes place before commencement of the dynamic bidding. 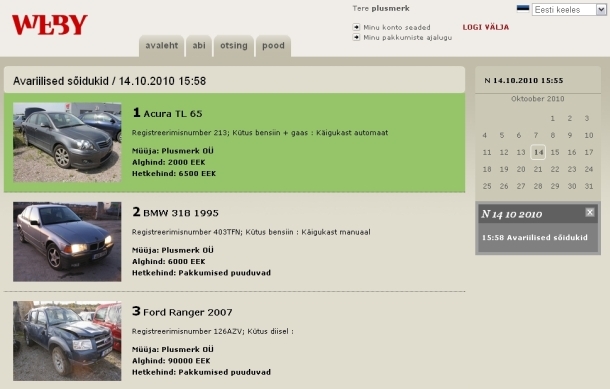 You can make initial offers with regard to all cars and objects put on the auction (see, the calendar). 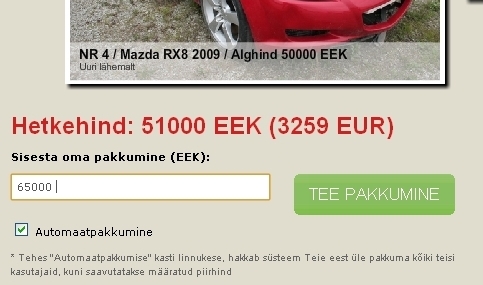 In order to make an offer you have to click on the green “TEE PAKKUMINE” (“MAKE AN OFFER”) button. The amount of the offer is displayed in the field on the left of the button. By default this field has the sum that exceeds the previous offer by a single step. You may change the amount of the offer manually, by indicating the sum that exceeds the previous offer by two steps or more. Before registration of your initial offer or automatic bidding, you must confirm the offered sum by clicking the “kinnita” (“confirm”) button. Where the initial price was not offered, the program offers you the initial price for confirmation. Commencement of the dynamic bidding is indicated by the green information box in place of the calendar that shows the bidding that is taking place at the moment (in real time). TAKE NOTE! 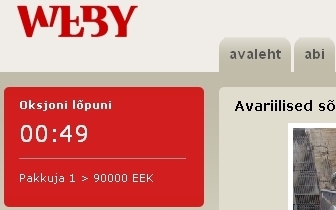 If you wish to monitor the auction in real time or participate in it, click on “Uuri lähemalt” (“Learn more”) link. You will be taken to the real-time auction (this window is refreshed automatically). During the entire dynamic bidding process the window in place of the calendar will inform you about the object/car on sale at the moment, even if you are viewing an auction planned for the future or if you are browsing some other section of our website. Up to 35 objects/cars may participate in a single bidding (more in special cases). 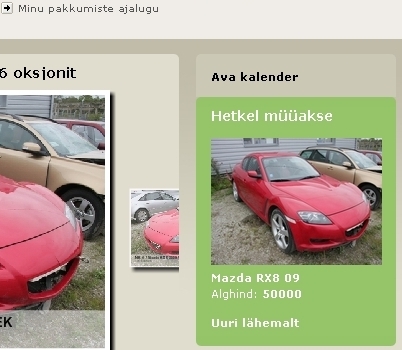 1 object/car can be sold on the bidding at one time. TAKE NOTE: after commencement of the dynamic bidding it is no longer possible to submit initial offers or use automatic bidding for the objects put on the auction. 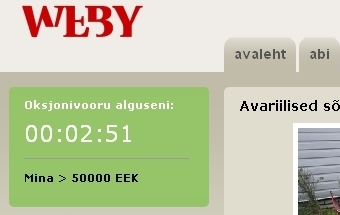 In order to make a bid during the dynamic bidding you should activate the bidding by clicking on “Uuri lähemalt” (“Learn more”) link (as described above) and wait for the object that interests you to be put on the auction. To make your bid simply click on the button with the respective sum. Attention! During the dynamic bidding the program does not ask for confirmation – every click on the button is immediately displayed as a valid bid. On the dynamic bidding every lot has 1 minute during which every user who has confirmed his/her identity and has authorized on the website can offer a higher price. Where a higher bid is registered within 1 minute, the respective sum is added to the offer price and the bidding timer restarts. This is repeated until no more bids are placed. The auction is won by the user with the last bid. 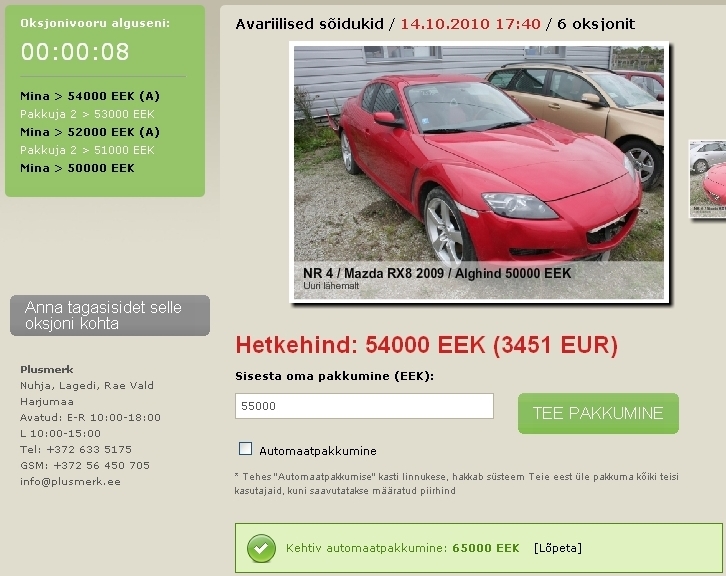 After you make your starting bid you will have an option to activate the automatic bidding by ticking the box “automaatpakkumine” (“automatic bidding”). By allowing automatic bidding you command the program to make bids that are one step larger than previous ones made by other participants (until the bid reaches the maximum sum indicated by you). TAKE NOTE! In case of several equal bids the auction is won by the user who submits his/her bid earlier. You will receive a confirmation in connection with registration of the automatic bidding. Automatic bidding can be turned off at any time before the dynamic bidding starts. All the bids made in connection with particular auction are displayed on the left in the topmost part of the page, right below the auction clock. Letter (A) marks automatic bidding. Click on “Unustasid salasõna” (“Forgot your password”) link in the top right corner of the page. The information necessary to change the password will be sent to you by email. In order to participate in auctions you must be a registered user (see, register as a user link on the main page). In order to register as a user you must fill in the required fields on our page. In order to be able to make bids you must also authenticate yourself using an ID-card or an Estonian Internet bank (Swedbank, SEB and Sampo). Where you are unable to do so you may proceed without authentication by clicking on “Jätka” (“Continue”). We will activate any users registered without following the authentication process after checking the submitted details and concluding the user agreement. In the top part of the main page of our website enter your user name in the left box and your password in the right box and click on “Logi sisse” (“Log in”) or press Enter. After successful login you will see the text “Tere kasutajanimi” (“Welcome, user name”). There is the auction calendar in the top right corner of the page, where the dates of bidding are highlighted. By hovering your mouse over the highlighted dates you will see details with the name of the biddings taking place on that day. By clicking on a date on the calendar you will open the list of bidding(s) ( the list view ). Time left until commencement of the auction or the dynamic bidding. It is also the time during which you still can make your initial offer and/or set up automatic bidding. TAKE NOTE! Where your bid is the leading one, the clock is colored green. TAKE NOTE! Where your bid is not the leading one, the clock is colored red. 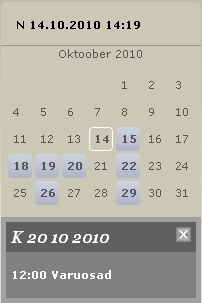 By clicking the highlighted date on the calendar you will see the list of the objects offered. 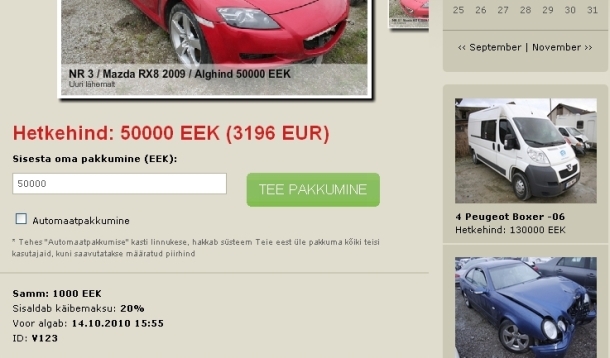 Having clicked on the auction that interests you, you will see a larger picture of the car/object and detailed information on it.